Built for day-to-day printing, the Oki C531 printer is the ideal solution for small businesses and workgroups in need of a reliable colour printer that produces high-resolution prints at fast rates. It uses high-definition toners that enhance the look of documents and images, while keeping running costs low. The Oki C531 colour laser printer delivers professional-grade prints and is a step above other models in the series, thanks to its flexible media handling capability. However, others may still find this model inferior to other laser units that offer scanning and copying as standard features. 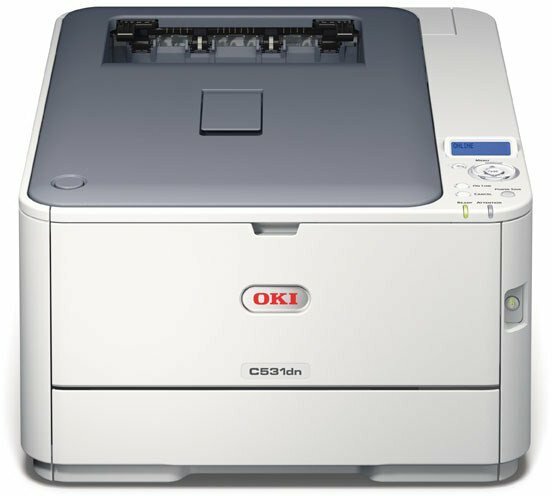 The Oki C531 colour LED printer has a typical laser printer design. It has a small control panel on the right side of the device's surface and printed outputs can be collected from the output bin on top. The Oki C-531 offers flexible media support, able to handle A6 size papers and even 1320mm banners. The C531 laser printer can also receive card stock (220gsm) for printing business cards and similar types of outputs. The best selling points of the Oki C531 colour printer are its media flexibility, fast print rates, and built-in duplex capability. It also speeds up print work, as it can produce as many as 26 pages per minute in colour and up to 30 pages per minute in black and white. It has a larger internal memory (265MB) that can be expanded to as large as 768MB. The device is suitable for workgroup use, thanks to its network interface. Colour toner for the Oki C531 printer is available in high capacity cartridges for a cheaper cost per-page output. One disadvantage of the Oki C-531 however, is its low paper input capacity. The unit is also just a single-function device capable only of colour duplex printing.